* Physiology: Whilst the life of orcs are often brutal and short there's more to them than meets the eye. 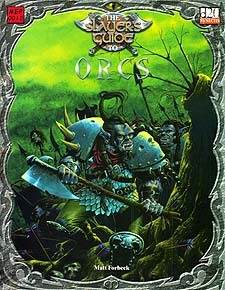 * Habitat: Where and why orcs can most often be found. * Society: From Tribe to warcamp to raiding party, orcish societies are geared towards warfare. * Methods of Warfare: There are few things for which orcs are renowned, but fighting is one of them. * Roleplaying with Orcs: Breathing life into orcs as a race, including the dread Battle Shaman Prestige class, blessed by their gods for combat. * Scenario Hooks: A selection of ideas on how to use orcs in your campaign. * Gruk's Kamp: A detailed orc camp is presented. * Orc Reference List: A ready to go list of characters and enemies for players to face, when they stumble across these evil creatures.